Not true and by this logic, Piping Plovers would be nesting in parking lots from here to Canada! 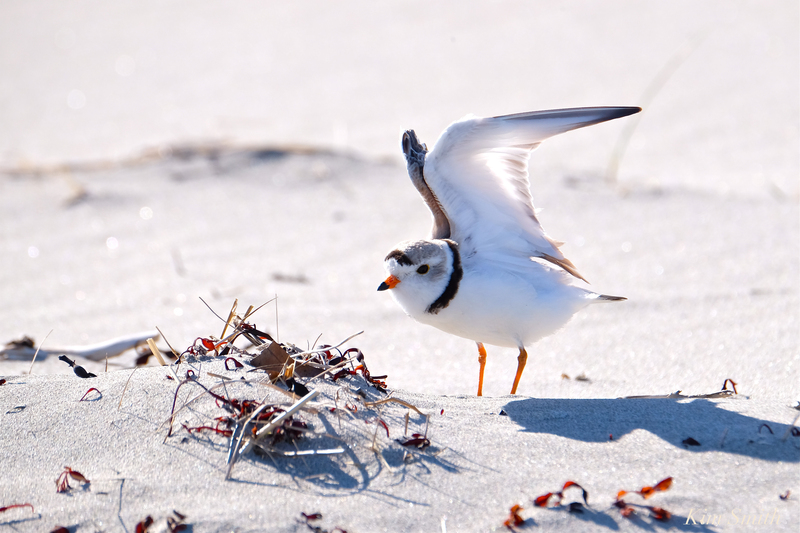 Piping Plovers arrive at Atlantic coast and Great Lakes beaches every year from late March through the month of May. Along the Atlantic Coast, they breed from the mid-Atlantic states to New England and all the way up the coastline to the maritime provinces of Canada, as far north as Newfoundland and Labrador. The temperature is no colder on a Gloucester beach than a beach on Plum Island or a beach on Prince Edward Island. Piping Plovers typically nest on both narrow and wide sandy beaches. Unfortunately, nests and eggs are occasionally swept away during a storm when the tides are high. Beaches all along the Massachusetts coastline were hit hard by late winter storms however, Piping Plovers often do well on beaches where winter storms have created a change in the topography. Storms generate what is called overwash, when water from the sea carrying beach sediments flows onto the dunes. Overwash is critical for beaches to maintain their shape and size in the face of sea level rise. The best foraging areas for Piping Plovers are known where you have large expansive mudflats created by storm overwash. Good Harbor Beach Piping Plover parking lot nest and eggs. As you can see, there is a theme to these comments, to blame the fact that the PiPl are nesting in the parking lot on everything else except what in actuality drove them to the parking lot. Constant and unrelenting disruption by dogs off leash in the nesting area is what forced the Piping Plovers to the parking lot. By speaking frankly to help bring awareness about what occurred in the nesting area at Good Harbor Beach during the months of April and May is by no means meant to malign or portray as wicked and threatening dogs or dog owners. Disruption by dogs was witnessed by myself, by fellow PiPl volunteers, as well as by Greenbelt and Mass Wildlife representatives, and the dog officers. In the minds of our nesting pair of Piping Plovers, the Good Harbor Beach parking lot was seemingly the safest location at the time of mating and nest scraping, as it was also the quietest and least disrupted. Readers may be wondering, why did our pair not nest in the wide expanse of dunes? I think the green growth found in the dune habitat does not provide protective camouflage as do the white painted lines and gravel found in the parking lot. If you have stopped by to see the PiPl in the parking lot, you may have noticed that they are practically invisible, the way they blend in with their surroundings. The little pair are certainly resourceful! Don’t mistake their resourceful choice of nesting locations as ideal. The parking lot is a horrendous place to nest. It is far away from their food and water. Piping Plover parents take turns sitting on the nest. In a normal situation where the nest is on the beach, one sits on the nest while the other forages close by, but at the same time is always on the lookout to zoom in and help defend the nest from real and imagined predators. Under the parking lot circumstance, while one is brooding in the lot and the other foraging on the beach, they are not in constant contact or communication with one another, making the chance of successfully hatching young all that much slimmer. And safeguarding the chicks during their first days after hatching in the parking lot, until they make the epic journey to the beach, is going to be a monumental challenge and take tremendous teamwork. Mama at the parking lot nest exclosure while Papa is foraging at the beach and out of the range of communication. The problems that arise with dogs on the beach during shorebird nesting season has been dealt with and resolved conscientiously in coastal communities over decades. With gratitude to Mayor Sefatia and the DPW, effective signage has been posted at each beach entryway. The signs need to be in place all year round because they also have a No Dunes icon. Letting people know that throughout the year the dunes are off limits to people and pets will help lessen erosion and create a healthier dune habitat, which over time will help protect our beach for everyone. Education about the life story of the Piping Plovers. Recently a meeting of the Animal Advisor Committee was held at City Hall. Many suggestions and proposals were discussed. A very simple and effective solution for Good Harbor Beach is to close the beach to all dogs beginning April 1st and to reopen on September 16th, making the time dogs are allowed on the beach only two weeks shorter than the existing ordinance. 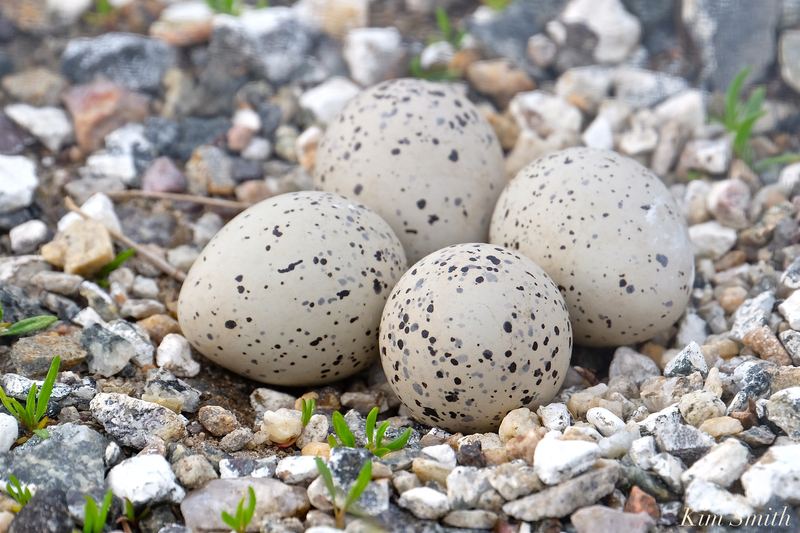 The time period from April 1st to September 15th would give all shorebirds the uninterrupted space needed to mate and establish their nests, and time enough for the young to fledge. The Piping Plover mating dance is elaborate. Each time the PiPl are interrupted, they do not resume where leaving off, but begin the dance anew. In the above photo, the male is high stepping all around the female while she has positioned herself to accept the next step, where he jumps on her back, and they connect, cloaca to cloaca. The courtship dance takes about twenty to thirty minutes while copulation only lasts a mere minute. 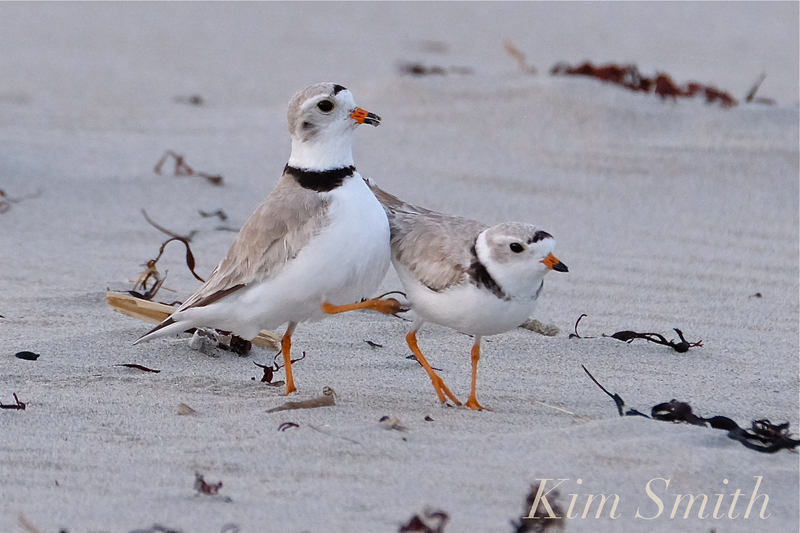 This entry was posted in Birds, Cape Ann Wildlife, Gloucester, Good Harbor Beach, Piping Plover and tagged Beautiful Birds of Cape Ann, Charadrius melodus, Good Harbor Beach, Good Harbor Beach parking, how you can help the plovers, nest, Piping Plover, Piping Plover myths debunked, Piping Plover nest, Piping Plover parking lot nest, Piping Plovers on May 23, 2018 by Kim Smith.